Turn your regular old TV into a Smart TV with this script that emulates a Wemo smartplug called “Fauxmo,” an IR led circuit hooked up to a GPIO pin and a Raspberry pi! This is a walkthrough for getting it setup on your raspberry pi on your home network and making it callable by your Alexa Smart Home assistant. # Don’t start irexec, even if a good config file seems to exist. Reboot your RaspberryPi after making this change. Start the server – you should see some debugging text indicating the server has started polling. The Echo integrates with the WeMo home automation protocol – simply say “Alexa, discover my devices” and it’ll search the local network for WeMo devices. So let’s give it a device to discover! Say to your Echo “Alexa: discover my devices”. She’ll take a few seconds to find the new device. If she doesn’t find it the first time, try killing and restarting the process and discovering devices again. Say, “Alexa: turn off TV”, or “Alexa, TV on”. You’ll see an echo of the output Philips TV On/Off command from: IP of alexa. Alternatively you could always think of other ways issue the IR commands through SSH to the raspberry pi from the command line. I have had some fun setting timers for volume mutes during commercial breaks. Hi there. I got Novation Launchpad connected with the Raspberry Pi running the Raspbian installation and talking with Pure Data. I wanted to be able to load PD patches on the Pi, let it run under the hood of the launchpad and output custom midi. 2. Got PureData installed and got PD talking with alsa. 3. Got dependancies and configured the launchpad executable driver “launchpadd” on the pi. 4. Installed other drivers for other perferials, I used the MidiSport Uno usb midi cable. 5. Loaded up my PD skeches on the Raspberry Pi and started them up. 6. To have the Launchpadd executable run at startup I changed the /.profile file in linux to start the “launchpadd” program at login. Some of the things I would like to do to finish this project is to build an awsome enclosure to hold the pi and the launchpad also use the gpio pins for midi instead of the usb to midi converter. Launchberry Pi from james on Vimeo. I’m using a sketch that changes the output channel of the LP with the top row of buttons. its like having 8x launchpads. I made this Windows 8 compatibility list for some clients of mine, and I thought I would share it with all of you. This is an unofficial compatibility list, and is subject to change at any time. I personally have not tested any of this stuff on Windows 8. This list was compiled based off of companies compatibility statements and online user forums. If you have any information on items on this list or ones not on the list, please let me know and I will update it as more detail come in. ** These can be installed under Windows 8 without any issues, as long as the PC is connected to the Internet. During installation Windows will download and install the Microsoft .NET 3.5 Framework, which is required for a successful installation. When I was a kid, I was once told that you could fix a scratched CD by coloring in the side of it with a Sharpie. For me it never worked, but apparently the same technique can improve sound quality of the CD. I never noticed any change in sound quality when I used a Sharpie to color in my CD’s, but that could be do to the fact that I was only doing it to the my CD’s that were scratched to hell or the fact that at that time I was listening to everything through a pair of Koss headphones. I have not tried this in recent years on better equipment, but I am still not sold on this one. Here’s what AudioPrism has to say about their pens. “We discovered that during playback, that a significant quantity of stray laser light bounces around inside a CD. This stray light eventually finds its way back to the pick-up assembly, creating jitter. CD Stoplight was developed to passively reduce the the effects of stray light that ultimately causes jittar. By absorbing the stray light at the transport passively, rather than attempting to reduce it’s effects downstream electronically, jitter is reduced at the source-keeping it out of the playback chain. We live in a world where people are listening to Lady Gaga one minute and John Coltrane the next, so to make a genre specific anything, your already digging a hole for yourself. I definitely have my moments of music ADD, and I am not the kind of guy that wakes up in the morning and decides what kind of music I am going be listening to through out my day. So for me these are a pass, I’ll stick with my headphones and figure out the EQ’s for myself. 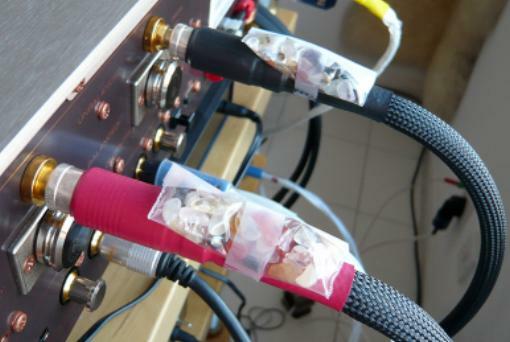 There is quite the debate on online forums about whether or not Frequency Alignment cables actually do something or not. There are many people that swear they actually make a difference, but my first question for those people are; What kind of cables did you use before? High quality cables will sound better then lower quality cables. So I fall on the more skeptical side of things, but would love hear an electrical engineers take on this. At the end of the day though let your ears make the choice. Ebay is a great place to find and purchase gear for a good price, but buyer beware some people want to scam you. I have been working in music shops for a good portion of my life, and have seen lots of fake Shure SM58’s that people have bought off of Ebay. The story is always the same, the customers comes into the shop with a 58 they bought off of Ebay for $20 – $30. They usual have inclination that something is weird with the mic. I can almost tell instantly if the mic real or not. Some common signs that the microphone is fake are; the weight of the mic usually is the first give away. Fake SM58’s tend to be noticeably lighter than the real thing. The color of the mic is the next thing I check out when determining the authenticity of the mic. Fake SM58’s will tend to have an inconsistent color or the color of the mic is a little bit lighter than a real SM58. Finally, I check out the font and size of the text on the microphone. 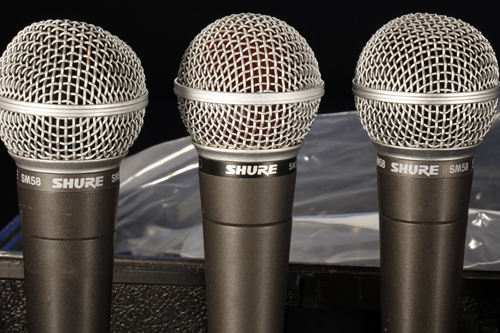 A fake Shure SM58 will usually have similar but not exact text on the mics label. The best way to avoid ending up with a fake SM58 is to by making sure you buy from a reputable dealer on ebay, or better yet most music shops usually have a handful of used Shure SM58’s that tend to sell around the $50 range. Pretty much anything that Machina Dynamica sells on their website belongs at number one on this list. At first glance Machina Dynamica’s website seems like it is a joke audio website, but the more research I do into the company says otherwise. Below is a link to an email conversation between the owners of Machina Dynamica and a potential buyer. This is a known fake audio website, a little extra something just for fun. So there has been a lot of work with getting the launchpad running on linux. We talked about it a couple years ago and there has been some really cool advancements that I wanted to share with everyone. ALSA has now supported the Launchpad since V1.0.24 so that’s exciting news! AlSA changelog, the Advanced Linux Sound Architecture is bundled with Ubuntu/Debian desktop versions of Linux. A homebrew kernel for midi support in Ubuntu “by Will Scott” get the project at the Launchpadd Google code page. This is a great project I stumbled up on, it’s called Darwin Tunes. The website offers listeners some music that was generated by software and asks them to respond with an appeal level with a score of 1-5. then after calculations new performances are created with the bad scoring melodies thrown out. here you can here samples of the different generations at Darwin Tune’s soundcloud. 8bandEQ is a standalone max/msp application for the Novation Launchpad. It monitors an incoming stereo audio feed and displays the frequency data on the Launchpad’s buttons. can be used alongside any other launchpad programs. It’s been awhile but its time for another round of android music making app favorites and it has recently come to my attention that there is currently a fundamental flaw with android in the respect of live performance. Some of you may have already noticed this while playing around with some of the multi-touch keyboards and synthesizers with surprisingly long attach and release times while switching keys and notes…oh the horrors of latency. I wont delve into the exact figures released in this article for lack of more specific data on which phones performed best, but the article still states that the more sophisticated android handsets still have almost twenty times the latency to IOS devices. I always hate starting off on a bad note, so here’s some good news. Android is still open source and developers are working on integrating API’s like OPENSL_ES into their applications which will further cut the latency so we can rock our android tablets and phones live. One of my favorites which I reviewed last time Mikrosonic SPC has already implemented this in their newest update. I can only hope that developers will continue to optimize and cook this into their music applications. Now then…on to the music favorite picks. Ever since I’ve acquired an android tablet I have been Su-premely jealous of Ipad owners applications like the Beat Maker series. I love pads and buttons and was absolutely ecstatic to see someone finally emulate an MPC in the android environment. The application runs great and with a dual core tegra 2 tablet, I cannot say the same for my dated Nexus One 1ghz snapdragon, but I almost forget about the aforementioned “latency” issues while messing around with it on my overclocked G Tablet. I highly recommend trying the lite version first to make sure that your device will run the application smoothly. Nanoloop is another cross platform favorite of mine available on IOS, Android and even your gameboy, and I must say it easily became one of my favorites. This sequencing application has a very easy learning curve and could easily be one of the most fluid options for those of us stuck with smaller screen real estate, not to mention it doesn’t require a whole lot of processing power so it can run smooth as butter on your mid to low end devices as well. The sounds you can make with this nifty little application are pretty diverse using just the microphone sampler and sequencer to pump beats and sounds out of your handheld. I only have one gripe about it and that is GIVE US LONGER PATTERNS and DIFFERENT METERS! 4/4 is great but I like having options…also I wouldn’t mind some filters and effects overlays. Illuminated Sounds took a trip down to Portland to go check out their synth meet up. Here are the pictures we got. Here’s the pictures we got from the PNW Synthfest 2011. Just heads up the Portland Synth Meet is taking place on November 20th. Anyone going?